It wasn't hard to pick what I should do in the January of the year focused on thriving. The verses that inspired the year held the clue. What distinguishes the man who is like a tree planted by streams of water? "His delight is in the law of the Lord, and on His law he meditates day and night." Now, I have started many a January Bible reading programme. But never one that has ever really survived January. And one of the reasons why? Numbers. And that's if I managed through Leviticus. 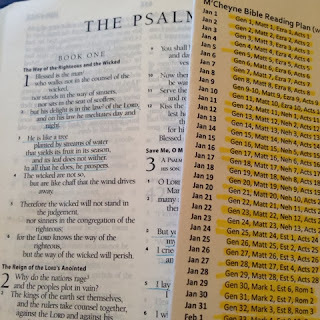 Last year I started a reading schedule that had me read three to four chapters a day but every day of the week I was reading from a different section of Scripture. For example, every Wednesday I was reading from Psalms, every Thursday from a Gospel, every Friday from Old Testament history. I was grateful for the variety but it wasn't enough and it was too much all at once. It was hard to keep track of the story in Genesis when I was only reading that book every Monday. And having to read maybe four chapters of genealogies one day a week was hard to do. 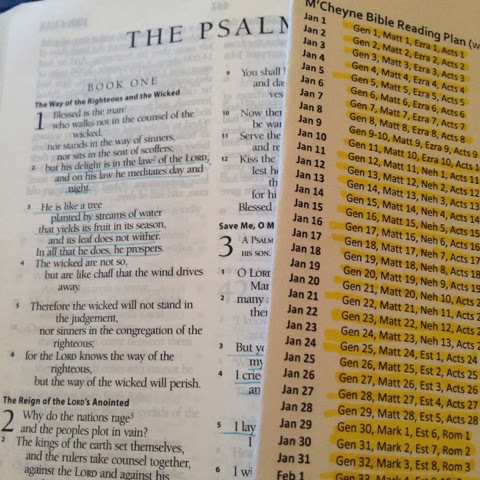 This year I stumbled across the McCheyne Bible reading plan at just the right time - a couple of days before the new year. It was printed in a book I'm reading that also restated the vision for why committing to read Scripture in this way is a good thing. And so, I began. And I made it through January and am continuing through February. Now, there have been days I've missed but there have also been days I've caught up. It has been so good to be consistently going through Scripture in this way, instead of doing studies in a particular book or on a particular topic. It has also been incredible to read Genesis, Old Testament history, a Gospel and Acts and hear all four chapters declare the same point in different voices and contexts. Four authors, spanning centuries, declaring the goodness of God, His salvation or promises. So, it has been a joy in January to get stuck into a Bible reading routine and I'm thankful for how God is shaping me and pulling me deeper through this.